December 4, 2017, New Delhi: The government has recently been pushing the consumers from all sides to link their Aadhaar with all important documents like PAN, bank account, mobile number, insurance policies etc. There have also been reports that some ecommerce sites have been asking consumers to link their website accounts with Aadhaar when they are trying to track a lost package. A lot of other internet based companies like e-wallets have also made Aadhaar mandatory for the consumers to use their services. 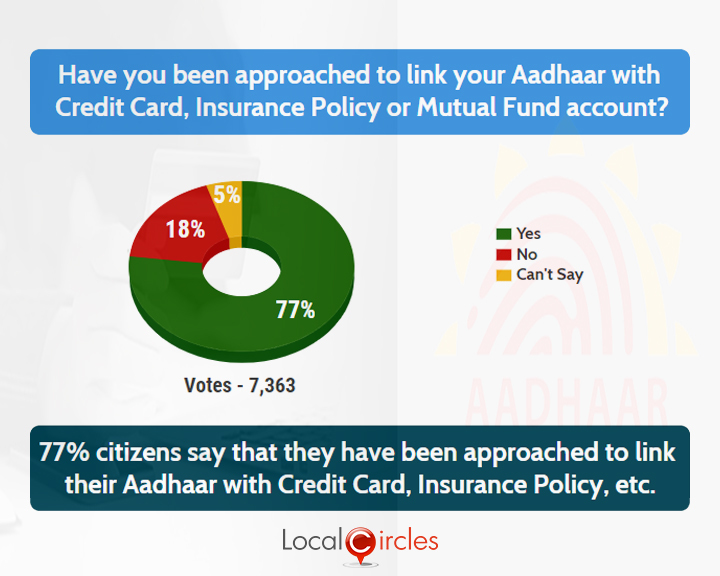 LocalCircles conducted a survey to understand if people have been approached to link their Aadhaar with credit cards, insurance policy, mutual funds etc. and if they would be comfortable in linking Aadhaar with ecommerce sites and payment wallets. The survey received more than 20,000 votes. The first poll asked if the citizens would feel comfortable in linking their Aadhaar with their eCommerce site accounts. 61% said they would not be comfortable while 30% said they were fine with it. 9% chose not to answer the question. Question: Do you feel comfortable linking your Aadhaar with eCommerce sites? Users said that companies like AirBnb, Uber etc. also ask them to upload a copy of their Aadhaar while registering with them as a safety measure, so that their correct identity could be determined. Question: Do you feel comfortable linking your Aadhar with payment wallet account? 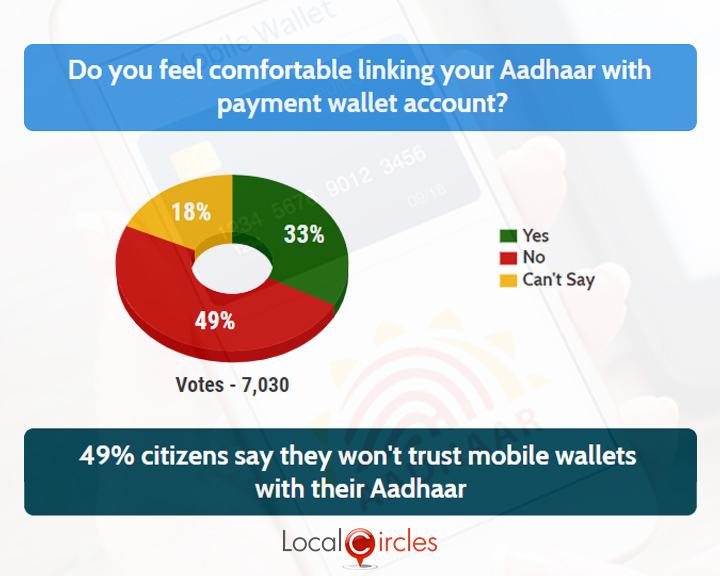 When asked if they would be comfortable in linking Aadhaar with their payment wallet accounts, 49% said no, 33% said yes, and 18% were neutral. With eCommerce becoming very popular, people prefer keeping money in their eWallets so that their payment goes out smoothly while shopping online. Question: Have you been approached to link your Aadhaar with Credit Card, Insurance Policy or Mutual Fund account? The next question asked consumers if they have been approached to link their Aadhaar with their credit card, insurance policy or mutual fund account. In response, 77% said they have already been approached while 18% said they have not been approached yet. 5% were not sure about it. 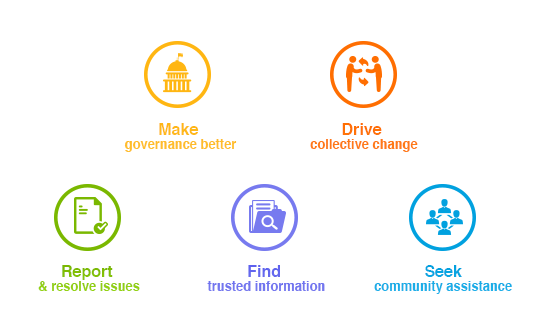 Citizens have expressed strong concerns about their Aadhaar data being leaked/hacked as a result of linking their Aadhaar with private operators. An earlier poll had asked citizens if there should be a financial penalty for banks, telecom providers or any other organizations that leak their Aadhaar, bank or call data transaction details, to which 94% gave a nod. In case their private information finds a way out, they said that the respective bank or telecom operator should be severely penalised to ensure that they keep the data encryption measure to the highest levels. LocalCircles will be sending this report to UIDAI so that required action could be taken, and cases of data leak could be reduced.